Physician practices have big advantages over retail businesses like Starbucks when it comes to choosing new locations. How so? For starters, your practice’s existing records provide a wealth of information. If your practice has ties to a local hospital, for example, you can gather data from inpatient, outpatient and emergency department records. Combining this with demographic information and state databases on hospital discharges gives you a detailed picture of your service area. A surprising amount of demographic data is available free of charge from the U.S. Census database. It’s also important to get a profile of the providers already serving a geographic location. The National Plan and Provider Enumeration (NPPE) database can be downloaded free from CMS. This database contains provider name, specialty, address and more. Once the data has been gathered, you need to identify the criteria most important to your practice. The list can include statistics such as population growth rate, median age in the service area and traffic volume. For most practices, population growth rate and market share potential are usually more important criteria than median household income. Sometimes an attractive zip code can get ruled out because of the high number of existing primary care practices in the location. That’s where data analysis and common sense can guide your decision. Walmart’s rapid growth has been based in part on finding smart new locations near their existing stores. That’s a lesson for any physician practice scouting for an expansion site. It’s sometimes tempting to jump outside your service area to open a new office in an affluent (but distant) location. However, the results are usually disappointing. Heat-mapping is a graphical representation of data where individual values are displayed as colors. 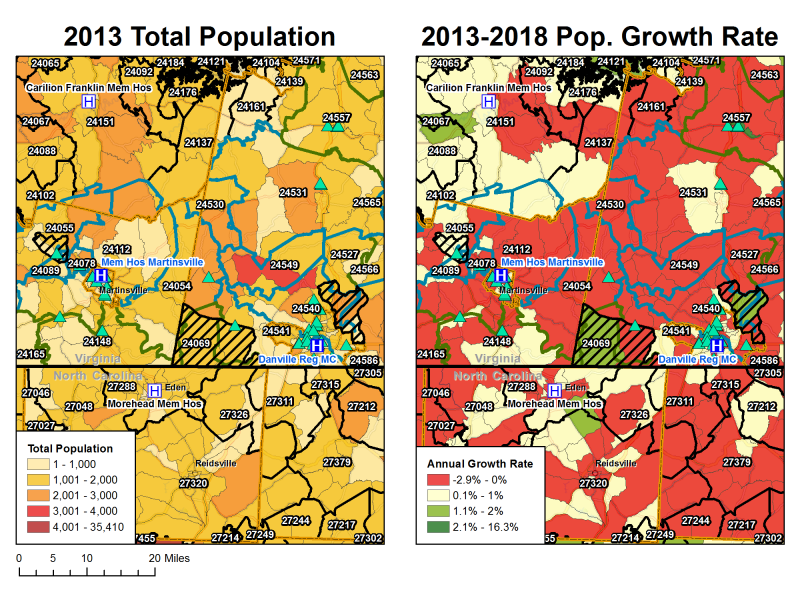 Here’s an example of how heat-mapping makes it easy to compare current population to the projected population over the next five years. Trying to analyze this information using spreadsheets alone would be incredibly frustrating and time-consuming. Practices looking for new locations generally either shoot from the hip or get buried in too much raw data. But mapping tools can help any practice find the ideal location — without the guesswork or spreadsheet fatigue. Article by Lee Ann Lambdin, SVP of Healthcare Strategy for Stratasan. To see how Stratasan can help you use GIS software to identify the best location for your new practice, contact Sean Conway or email sales@stratasan.com.